Today wraps up our final interview of May’s Month of Writers Blog Festival Or Whatever We’re Calling It. It’s been an exceptionally fun ride. I’ll write up all my thoughts about it tomorrow — in the meantime, feel free to wander back through the interview archives and learn more about these friends of mine whom I admire so much. It is fitting that the last interview I post this month be from a man whom I’ve known the least amount of time. 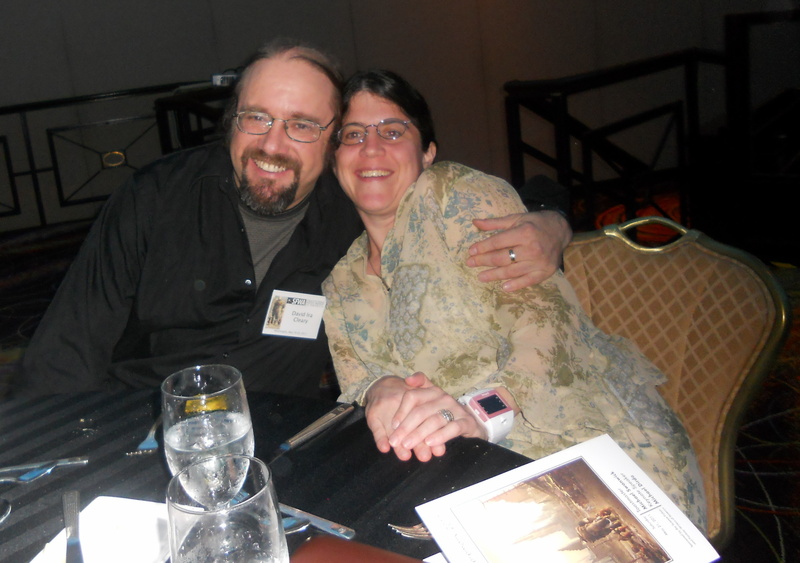 David and Cheryl Cleary sat with Mary Rodgers and I during the Nebula Awards banquet. Of course, directly after “Which entree did you order?” came the inevitable “What do you write?” question. For some reason, this question has always made me uncomfortable. I don’t know why; it’s not like I don’t have an answer. Perhaps it’s because I have too many answers. So far, my favorite answer has been “I write crap.” Albeit bestselling crap, but I’m sure the academic professor I was addressing at the party in question would have deemed it crap nonetheless, so I saved him from classifying it thusly in secret. When we asked David this question, his answer was “I’ve been published in Asimov’s,” which of course made me 1.) instantly jealous and 2.) want to know him better. And now, after this interview, we all know him a little better. Travel the world; I’m too claustrophobic for space travel. Music. It gives me structure to organize my thoughts. But I cannot recommend to listening to Killing Joke and the Cure over and over; it’s a bad head space to put yourself in, even if you’re writing a time-travel story to the 80s. No, not interested in staying up so late. two hours 3x a week after working at my day job, 4-6 hours a day on weekends. David Cleary was born in Wyoming, grew up and went to college in Colorado, and was convinced he should become a writer by his experience at Clarion (MSU) in 1987. He’s lived in CA since 1990. His first published story, “All Our Sins Forgotten,” was made into a Sci-Fi TV show, with Henry Rollins playing the lead character. He’s mostly worked in Silicon Valley, first as a programmer, then as a tech writer. He’s had stories in Asimov’s, Interzone, and SF Age, as well as in several anthologies. He lives in Oakland now with his wife Cheryl, whom he convinced to marry him in 2006 after an 11-year courtship. They have a great cocker spaniel, and three cats of variable temper.